Once your organization is on board with reframing, the next question is how to get started. In this section, we provide practical strategies incorporating FrameWorks’ recommendations into your organizational, advocacy, and media/social media communications. Throughout this process, try not to think like the expert you are, but like the audience you are trying to reach. A good place to start implementing reframing is to identify language that makes up the foundational content of your organization’s external communications – standard text that is used repeatedly online and in print to communicate the organization’s objectives and strategies. Determine which communications to prioritize based on volume and frequency of use, potential for impact, organization needs, and staff and resource capacity. For example, many organizations start by reframing About Us language, Mission Statements, and program and services descriptions. Be clear on the societal benefits of human services in general as well as your program specifically. Before telling people what your organization does, use the Value of Human Potential to tell them why. Example: everyone needs support to reach their potential; we help people reach their potential and contribute to their communities. Avoid jargon or short-hand, which can lead to misunderstandings of needs and services. Instead, use the Construction Metaphor to explain how your organization builds well-being to foster potential. Example: well-being is built by a team over time; requires planning, prevention, and maintenance; can be negatively impacted by shaky foundations, missing materials, life’s storms. Use Life Cycle Examples to normalize and expand the public’s understanding of who may need services as well as the benefits to the whole community rather than individuals. Example: we all need support throughout life; human services offer support throughout the lifespan; when we support well-being at every stage of life, we all benefit. Avoid alienating terms like “vulnerable” and “needy” that can reinforce beliefs that human services are for other people and obscure the benefits to the larger public. To engage your audience and convey the proper message, rely on an explanatory tone, use plain language and context, and emphasize your solutions. This will help demonstrate the community benefits of your services so people can visualize them and not come to their own conclusion. Below you will find tips and examples of how to apply these recommendations to specific foundational communications. Mission Statements offer a quick, concise description of an organization’s purpose and often appear across multiple platforms, including websites and publications. When the Human Services Council in New York reframed their Mission Statement, they shifted from a reliance on invoking compassion for those in need to utilizing the more powerful value of Human Potential to define human services as something that we all benefit from across our life span. Compared to Mission or Value Statements, “About Us” language provides more details and greater opportunities for incorporating the entire Building Well-Being Narrative. When Caritas of Austin reframed their “About Us” language, they connected stable homes to human potential and community benefits, emphasized well-being and the services to achieve it, adopted the construction metaphor, shifted the focus away from individuals, and removed jargon and value-based terms. Beyond the content above, human service websites often contain additional descriptions, including organizations’ history, their scope of work, and statistics about their services. Reframed text should be sure to emphasize explanatory language that is clear and specific about the services offered, rather than crisis language. Furthermore, be careful about how you use numbers, such as the amount of funding and individuals served, which can be confusing or meaningless without context. Photos and graphics are powerful storytelling tools. Prioritize images that show multiple people interacting in communities and public spaces and avoid images that are tightly zoomed in on an individual. Image framing can be applied to websites, publications, media posts, and anywhere else they appear. Human service organizations have long relied on telling stories of personal success or struggle to convey the impact and importance of a service or policy. However, this type of storytelling can have unintended consequences when the examples focus so tightly on the particulars of an individual’s story that the broader context and implications are obscured. Client examples should contribute to a thematic story, one that helps the audience see trends, systems, and solutions, rather than focusing narrowly on an individual’s actions or challenges. Public policy plays a critical role in positioning communities to build and maintain the well-being of their residents at every stage of life. In order to make good decisions about the quality of, access to, and resources for services, policymakers need to understand how human services work, why they are important, and that they are a priority for the public. Similarly, stakeholders benefit from understanding how policy and practice affect community well-being, which is often accomplished through reports or other publications with research and recommendations. 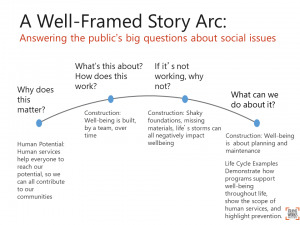 Reframing public policy communications and other advocacy communications using the Building Well-Being Narrative can help provide a clear understanding of the societal value and collective benefits of the full range of human service programs and policies. As proven by the FrameWorks Institute, this frame successfully increases support across a nationally representative sample of the public, which means it worked well across race, gender identity, religion, and political ideology. Human services are a vital link to building human potential across the lifespan and creating thriving communities. Human services organizations work to make sure that everyone has the foundations of wellbeing: stable homes, healthy food, and reliable healthcare. Human services professionals are experts in building wellbeing. Our members work to build, shore up, and restore wellbeing where it is at risk due to structural inequities. In general, talking points are utilized internally or are shared with networks to help guide advocacy efforts and to mobilize or support coalitions. The National Human Services Assembly has integrated the Building Well-Being Narrative into policy talking points for its priority issues, including the federal budget, immigration, and the Johnson Amendment. Human service policy position statements, including op-eds and letters to the editor, provide the public with an informed perspective on the implications of a policy proposal. Using tested reframed narratives, taking an explanatory tone, avoiding jargon, and offering sensible solutions can deepen the public’s understanding of policies and increase the public’s engagement as advocates and allies. FrameWorks created a sample editorial demonstrating these techniques. See also, the National Assembly’s op-ed on a proposed reorganization of federal human service agencies and programs. Similarly, members of human service organizations may need to present testimony before public officials to defend a program, request additional funding, or advocate for a policy. Using the Building Well-Being Narrative can help ground your arguments in a shared societal value and help avoid alienating the audience. As part of the Human Services Communications Toolkit, FrameWorks created sample legislative testimony for a typical budget hearing that uses reframing strategies. In addition to more targeted policy advocacy communications, human service organizations also commonly issue reports on a wide range of topics including research findings; the needs of their community, constituency, or sector; or on specific programs. These products are generally accompanied by specific recommendations for policy and practice. Regardless of the intended audience, well-framed reports and similar materials will improve the efficacy and success of your message. Beyond the Building Well-Being Narrative and other well-framed language, make sure that your images, individual stories, and data are strategically framed. 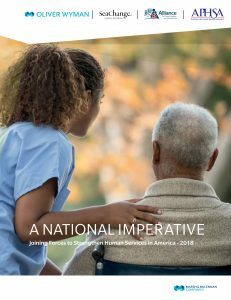 In their report, “A National Imperative: Joining Forces to Strengthen Human Services in America,” the Alliance for Strong Families and Communities and the American Public Human Services Association rely on reframing to explain how structural challenges are limiting the sector’s ability to address society’s most important priorities. More than ever, traditional and social media are key resources for organizations to communicate with and educate their constituencies, build networks, and engage in policy advocacy. As a result, it is important to intentionally and consistently reframe messaging through these channels. Both mediums have unique challenges for reframing and, therefore, unique strategies. For example, reframing within traditional media generally requires working with a reporter or editor who may be more inclined to use crisis language, vivid client stories, or narrow but entrenched “safety net” language. In contrast, social media allows organizations complete control over their message, but it must be in much shorter and less nuanced formats. Even within these contexts, organizations should ensure that images are zoomed out from the individual, stories are thematic, and data have context. Below are examples of partners who have successfully utilized the Building Well-Being Narrative within media and social media campaigns. The Human Services Collaborative of Greater Peoria seized a reframing opportunity to articulate the value and importance of human services to influential leaders in their region. 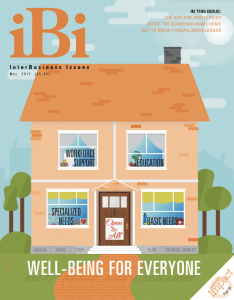 InterBusiness Issues, a local business magazine, dedicated their May 2017 issue to the nonprofit sector. The feature article, “Building a Greater Community,” was written by the Collaborative and explains how human services build, maintain, and restore well-being so that everyone can reach their potential and fully contribute to the community. The issue’s cover image also reinforces the concept that well-being is something that is built from many different resources. Social media sites like Twitter and Facebook are increasingly influential platforms for shaping the national dialogue on important issues. As a result, it is increasingly common to see examples of human service organizations and allies incorporating the Building Well-Being Narrative into their social media posts. Even a simple use of this frame helps the public understand why human services matter to all of us. 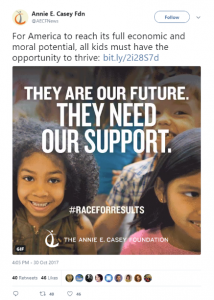 For example, the Annie E. Casey Foundation incorporated the value of human potential into their online campaign to publicize their “Race for Results” report. MODULE 1: Learn more about building the case for Reframing to gain support from key stakeholders, such as your CEO, board, and external partners. MODULE 3: Learn how to achieve sustainability by establishing Reframing as the lens through which to make communications, development, and policy decisions across the organization.